What Is The CIA Up To In Libya? And A Warning Note About The Uprising In Ukraine….. Thanks to that invaluable little troublemaker of a blog, “Moon of Alabama” for this alert that the CIA is stirring once again in Libya, in the form of a threat from its principal agent in the anti-Gaddafi opposition, Khlaifa Heftir that the militias will force the suspension of parliament and set up a presidential committee to run the country until fresh elections are held, the classic language of the would-be military takeover. Heftir’s links to the CIA go way back to 1987 at the height of Reagan’s efforts to unseat or destabilise the Gaddafi regime in Libya and I wrote about him at the height of the anti-Gaddafi push by the West and its rag tag band of Jihadist allies in 2011. One of the areas where this 1987 battle between Reagan and Gaddafi was fought was in a mineral rich slice of Chad on Libya’s southernmost borders where Heftir commanded a Libyan force of some 600-700 soldiers based in the region which was captured by pro-CIA forces controlled by the pro-Western Chad government. An angry Gaddafi denounced Heftir for his apparently all too ready surrender which understandably persuaded the General to throw his cards in with the anti-Gaddafi National Front for the Salvation of Libya (NFSL), by then a mostly US-based, CIA/MI6-supported band of Libyan emigres. Heftir’s force was shuttled from Chad to Zaire and thence to Kenya after which they were given the choice of returning to Tripoli or emigrating to America. About half went to the US with most of them settling in Virginia, as Heftir did, within convenient hailing distance of CIA headquarters at Langley, the group’s principal paymaster. The remnants of Heftir’s army helped form the basis of the NFSL’s military wing which duly joined the anti-Gaddafi uprising, if it can be called such a thing, in Benghazi in the Spring of 2011. After the fall and death of Gaddafi, Heftir disappeared, at least as far the Westerm media was concerned (not a difficult thing to do!) 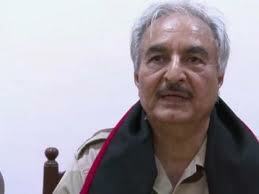 but he has now re-emerged at the leader of the militias that overthrew the old regime. However, it is just as likely that Heftir’s move reflects a judgement in the US intelligence community that the elected civilian government is hopelessly out of control and is vulnerable to Islamic extremists. If it collapses a key ally against Al Qaeda and a major supplier of oil and fresh water will once again have fallen into the wrong hands. The CIA may have concluded that what is needed is a return to military-style dictatorship of the sort that Gaddafi led for so many years, although a dictator that this time is staunchly pro-West. Step forward Khalifa Heftir, your day in the sun may have arrived! The unknown factor in all of this is Heftir’s abililty to deliver on his threat. Some observers believe his is a shadow army but it might be wise to wait and see which way the Americans jump for a more accurate judgement of that question. Whatever happens, Heftir’s warning is a reminder that Western governments’ enthusiasm for democracy in places like North Africa and the Middle East can be short-lived and fickle. Needless to say the Western media is paying almost no attention to the Khalifa Heftir threat. So watch this space. Again the value of the social media and its greater relevance and utility as a news source is underlined by such a story. This from the Toronto Globe and Mail is a timely warning that while the riots and deaths in Ukraine may look like a progressive event, especially when one of the target is Putin, the demonstrators, or at least some of them, have embraced very sinister elements indeed.